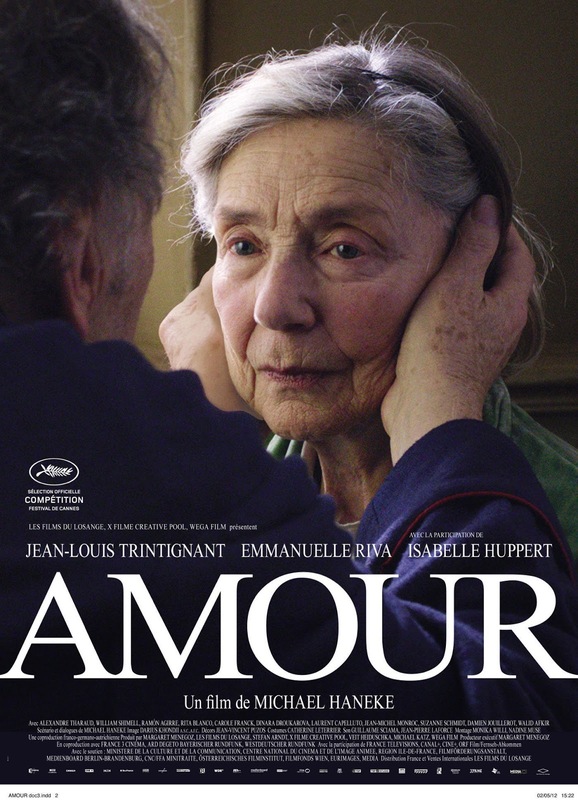 Amour is a film written and directed by Michael Haneke. It premiered in competition at the 2012 Cannes Film Festival where it was awarded the Palme d'Or for best feature film. Making it Haneke's second consecutive film to win the prestigious award, after 2009's The White Ribbon, and making him only the seventh multiple winner in the festival's history. 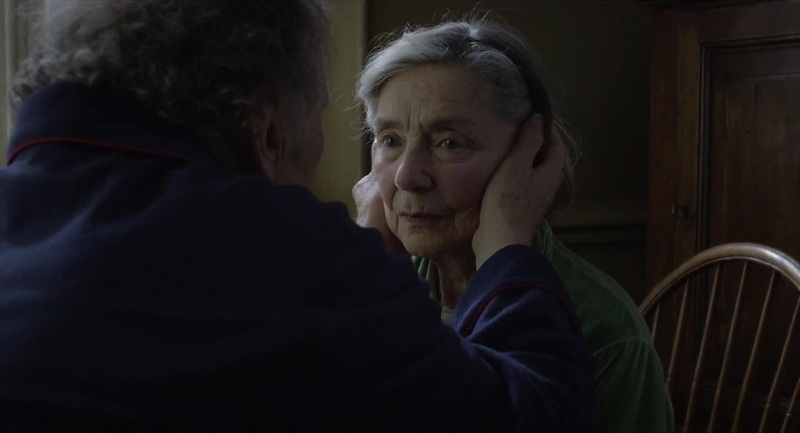 The film is also Austria's official submission to the 85th Academy Awards for Best Foreign Language Film. Without a doubt, there is a great deal of skill on display in this film. 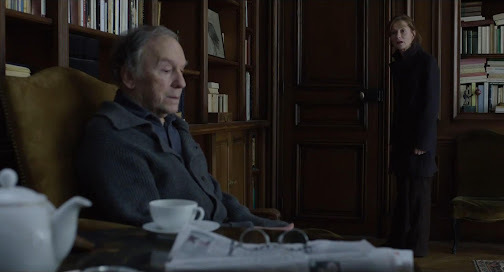 Haneke's screenplay is intelligent and elegantly paced, showing us the end first, so that there's no chance of mistaking what kind of film this will be, then returning to the last happy moments for Georges (Jean-Louis Trintignant) and Anne (Emmanuelle Riva), before her stroke signals the inevitable march towards the end. 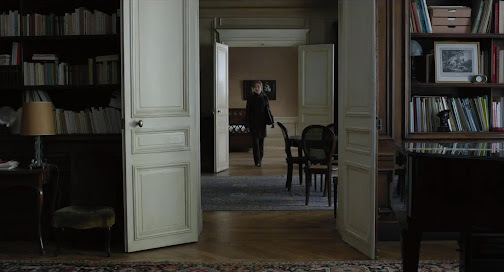 Those who are familiar with his previous work know that Haneke has a tendency to provoke or directly involve the audience in unsettling ways. There is still a bit of that here, but his methods this time around are restrained and respectful. An early scene of the elderly couple attending a piano concert of one of their former pupils is introduced with a straight on shot from the stage looking right at the audience. It's as if the screen is a mirror showing a reflection, implying that there is a real life Georges and Anna sitting among the crowd who will soon find themselves sharing the same terrifying fate. The rest of the film takes place entirely within the walls of the couple's Paris apartment. 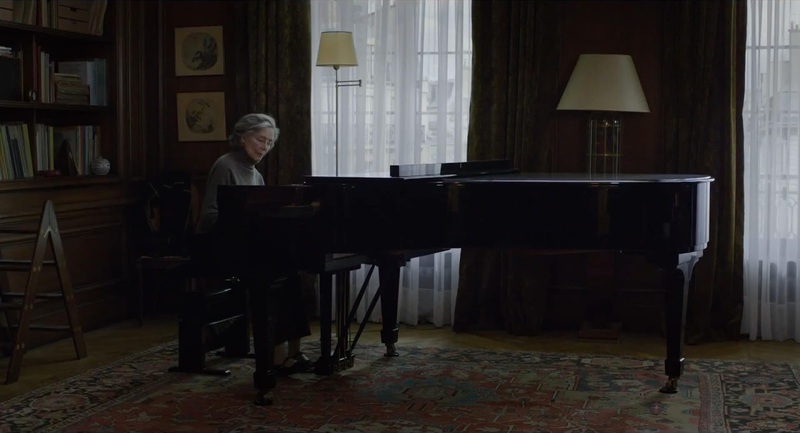 A setting captured with mostly static shots in natural lighting, painted with suffocating shades of grey by experienced Iranian cinematographer Darius Khondji. It's indoors, but it feels as though a perpetual rain cloud is hovering overhead. This limited and stationary perspective is another distinct attribute of Haneke's, as is the cinematic way in which he uses the location and his actors. Trintignant and Riva, legends of the silver screen for over half a century and both now in their eighties, are absolutely superb. Their performances are warm, subtle, and heartrendingly believable. Hers is by far the more physically challenging role, but his is no less emotionally affecting. There is also no escaping the thought that in playing these parts at their age, they could very well be bravely acting out how their own lives will end someday soon. 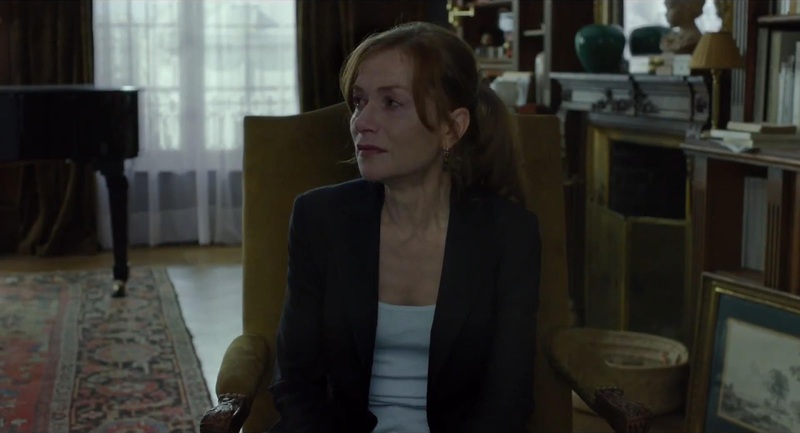 With all that going for it, not to mention a solid supporting turn from personal favorite Isabelle Huppert, and even having witnessed similar events firsthand, somehow the film never really pressed the right buttons for me. I imagine the film's power is in making us see ourselves, our parents, or our grandparents in the characters places, but all I saw was an old bourgeois couple headed to a predictable end, and while I was fully appreciative of the craft, the story left me feeling numb rather than devastated. Still, it is evident that this is the work of a mature and capable auteur, who has crafted a quietly intimate portrait to remind us in excruciating detail, that no matter how great the love, there is no such thing as happily ever after. Another film I really want to see. I hope it is going to be featured at Cinecity this year! Great, beautiful review BT - especially when it is not a film that hit you powerfully. As someone who loved this film, I really appreciate your analysis. I'm a post-Christian atheist (for want of better terminology) and for me Christianity (all religion) is primarily about cheating death - avoiding facing that which we are doomed to fear the most. (I know that is not all atheists view, but I have a soft spot for existentialism) For me, this film was about the inevitability of our death, the abject horror of our decline and the inevitable tragedy of the uselessness of our lives. The most chilling, desperate thing here, was the cameras unwavering eye. The camera sits and sits and sits, dragging us through the moments when, in life, we always look away. The response of all the "outsiders" to this couples decline was the response of all the young - sadness, desperation to "help" (take control) etc etc... but what ultimately can't be faced is that when we die, we die alone and we are forgotten. 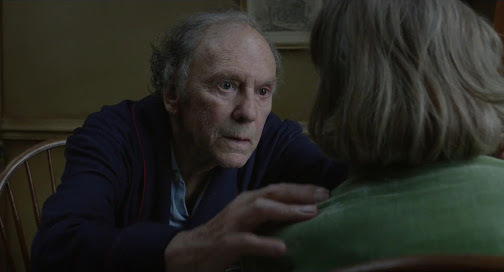 That is the horror story we all must live with, the one we all try to avoid and the one Haneke forces us to confront... he even makes us see decay. I found this horrific in its simplicity. It's a film whose images have become firmly planted in my psyche. This looks like the type of thing that'll run here for a couple of weeks.. I'll expect it, and if it comes on I'll watch it. I'm not sure how I'll be by the end of it and I think that's part of the appeal for me. I want to see this film desperately,what's the odds it gonna win the Oscar in your opinion,BT? I imagine this title would be a must have for any local festival. 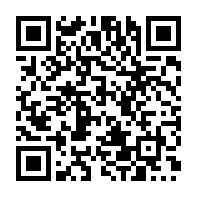 If not, it will probably get a home release pretty quick. pulled, torn, trampled on and smothered. It didn't bowl me over, but I still appreciate the craft. I fit loosely in that label as well, and this 'inevitable tragedy of the uselessness of our lives' is something I've been aware of most of my life, but seeing it presented in this way, an albeit very realistic and unflinching way, but without much of a story to go with it, failed to strike me as all that impressive or insightful or even horrific. It is a very good film, but I certainly don't think it's the type of challenging and innovative cinema that deserves to win and usually does win the Palme. Probably not the kind of film you are used to seeing, but it's one I'd love to hear your opinion of, if you do get the chance. I haven't seen enough of them yet to cast my final vote. However, I'd say the odds are low. A dual Palme d'Or/Best Foreign Oscar winner, has only happened four times in history, and the last one was 1988. As Haneke is my all-time favourite director I am really looking forward to seeing this one. What's your favorite Haneke film? 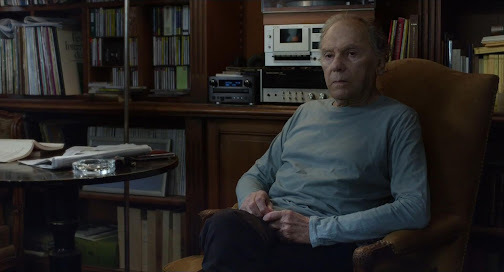 As far as I discover Haneke's films I like them more and more. Looking forward to this one! Obviously its screening in Perth. Obviously I should go because of the director BUT do I really want to see something that intends to leave its audience devastated? I know my friends won't thank me for inviting them. You can't pass up the chance to see a Haneke, and the most critically acclaimed film of the year, on the big screen. Even if it's one that will leave you feeling miserable.